Yarmohammadi, M., Saderi, H., Ezadi, P., Afshin Majad, S., Hashemi, M. (2010). The Role of Transforming Growth Factor Beta 1 (TGFβ1) in Nasal and Paranasal Sinuses Polyposis. 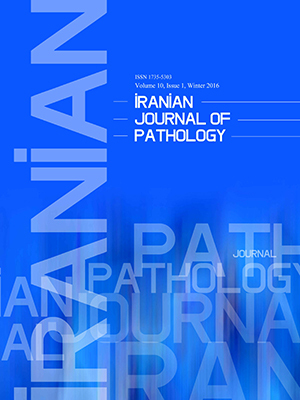 Iranian Journal of Pathology, 5(2), 72-76. Mohammad Ibrahim Yarmohammadi; Horieh Saderi; Pupak Ezadi; Siamak Afshin Majad; Maryam Hashemi. "The Role of Transforming Growth Factor Beta 1 (TGFβ1) in Nasal and Paranasal Sinuses Polyposis". Iranian Journal of Pathology, 5, 2, 2010, 72-76. Yarmohammadi, M., Saderi, H., Ezadi, P., Afshin Majad, S., Hashemi, M. (2010). 'The Role of Transforming Growth Factor Beta 1 (TGFβ1) in Nasal and Paranasal Sinuses Polyposis', Iranian Journal of Pathology, 5(2), pp. 72-76. Yarmohammadi, M., Saderi, H., Ezadi, P., Afshin Majad, S., Hashemi, M. The Role of Transforming Growth Factor Beta 1 (TGFβ1) in Nasal and Paranasal Sinuses Polyposis. Iranian Journal of Pathology, 2010; 5(2): 72-76. Background and Objectives: Nasal polyposis is a diseases resulting from complex pathogenetic mechanisms. Some studies showed that TGFβ1 had significant role in this pathogenesis. In this study, we investigated the roe of cytokines and mediators in polyp development. Material and Methods: In this case- control study, healthy nasal mucosal samples were obtained from 24 people undergoing septoplasty or rhinoplasty and polyp samples were obtained from 15 patients with nasal and paranasal sinuses polyposis undergoing endoscopic sinus surgery. TGFβ1 concentration was measured with ELISA in homogenized polyp and control samples. The difference of the mean concentrations was analyzed with Mann-Whitney test. Results: We detected TGFβ1 in 11 patients’ samples and in 22 control samples. There was not significant differentiation between the mean of TGFβ1 levels in two groups. Conclusion: Measuring level of TGFβ1 with ELISA technique in homogenized polyp and control samples have not significant differentiation.